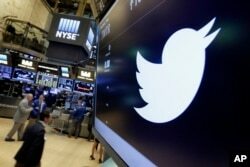 FILE - The Twitter Inc. logo is shown with the U.S. flag during the company's IPO on the floor of the New York Stock Exchange in New York, Nov. 7, 2013. Twitter introduced new safety measures this week meant to crack down on online harassment and protect people from viewing offensive material, but some free-speech advocates are concerned the changes could lead to censorship of unpopular ideas. 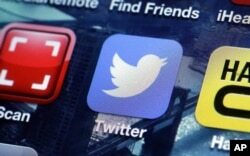 The social media company announced Wednesday that it would start hiding potentially menacing tweets, even if the tweets or accounts in question hadn't been reported as abusive. "We're working to identify accounts as they're engaging in abusive behavior, even if this behavior hasn't been reported to us," the company said in a statement announcing the changes. "Then, we're taking action by limiting certain account functionality for a set amount of time, such as allowing only their followers to see their Tweets." The so-called stealth bans could be placed on accounts, the company's statement said, if a Twitter user sent unsolicited messages to another user who was not following the sender. Twitter said it would "act on accounts" only when it was confident abuse had taken place, based on the algorithms it uses to identify illicit posts. This new automated stealth ban capability became a cause of consternation for Suzanne Nossel, executive director of the free-speech advocacy group PEN America, because she said it could easily become a solution "where there is really no problem that needs to be solved." FILE - A Twitter app on an iPhone screen is shown. "To take action when there hasn't been a complaint raises the concern of whether there will be mistaken blocking of accounts or suspending of accounts," she said. "That raises a risk." Twitter has been under pressure to address abusive speech and trolling on its platform in recent months after celebrities and others complained of sustained, coordinated abuse campaigns. Actress Leslie Jones notably swore off the social media service for a brief time last year after she was targeted by online trolls and harassed with racism and death threats. 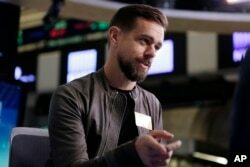 The incident led to a personal meeting between Jones and Twitter CEO Jack Dorsey, and several months later the company began introducing new tools to address online abuse. Twitter expanded its "mute" feature to allow users to block specific words or phrases from showing up in their notifications. It expanded users' ability to report hateful conduct. And it retrained its support teams on dealing with online abuse. These types of changes that allow users to have more control over what content they see and whom they interact with are positive steps, Esha Bhandari, a staff attorney with the American Civil Liberties Union's Speech, Privacy, and Technology Project, told VOA. FILE - Twitter's Jack Dorsey is interviewed on the floor of the New York Stock Exchange, Nov. 19, 2015. The chief executive apologized Thursday, Nov. 17, 2016, after the service let through an ad promoting a white supremacist group. The ACLU encourages companies to focus less on a top-down approach to censorship and more "on tools that allow users to control their experience on the platform," she said. "Attempts to put the thumb on the scale on the censorship side are prone to error and prone to human biases," Bhandari said. Newer tools introduced by Twitter, though, give the company a far greater role in controlling what content gets seen. In February, Twitter began pre-emptively hiding what it called "potentially abusive or low-quality tweets" from conversations on the website. The tweets will still be visible to users, but only to "those who seek them out." "Our team has also been working on identifying and collapsing potentially abusive and low-quality replies so the most relevant conversations are brought forward," Twitter said in a February statement. VOA contacted Twitter multiple times for clarification on guidelines used to identify "low-quality" tweets but received no response. Twitter also introduced a "safe search" feature in February that automatically removes tweets that contain "potentially sensitive content" from search results. A request for clarification on how this content is identified was not returned. Being a non-government entity, Twitter has no real obligation to preserve free speech on its website. But Twitter has billed itself as a platform for free expression, and on the Twitter rules page, it says it believes in "speaking truth to power." FILE - The Twitter symbol appears above a trading post on the floor of the New York Stock Exchange, July 27, 2016. Twitter, long criticized as a hotbed for online harassment, has been expanding ways to curb the amount of abuse users see. This is a role both PEN America and the ACLU take seriously. Both Nossel and Bhandari referred to the website as a sort of global town square, where everyone's voice has equal weight. "As a practical matter, decisions made by Twitter have a huge impact on the messages that we receive, and I hope that Twitter and other companies take those responsibilities seriously," Bhandari said. Nossel noted that Twitter has a financial incentive to be cautious on issues involving the balance between allowing free expression and stopping abuse. "The power and influence of their platform depends on the free flow of ideas, so I think there are commercial reasons why they would not want to limit [free speech]," she said. "And I think for their users, they do have a kind of softer, implicit contract that they are going to be a platform in which you can express things freely." Bhandari said it's important to find that balance, because if Twitter "allows a heckler's veto to take over," it will have a chilling effect on speech that's similar to pre-emptively hiding content. "One of the really important parts of that has to be transparency," she said.